by Kevin J. Vanhoozer and Owen Strachan, Baker Academic, 2015, 221pp. Theology is sometimes viewed as a somewhat abstruse body of knowledge, beloved of academic pointy-heads, but of little use to believers in their everyday lives. Or worse. In an episode of the classic BBC sitcom Yes Prime Minister, head of the Civil Service, Sir Humphrey advised the PM on his duties with regard to appointing a Church of England Bishop. He explained that the church was run by theologians and that 'theology's a device for helping agnostics stay within the church'. [See from 9 mins in on this episode]. That was back in the days of the Liberal ascendancy when Runcie was Archbishop of Canterbury, so perhaps the remarks had some justification. But they represent a sorry slur on theology and theologians. At its best theology is not about obfuscating unbelief, but faith seeking understanding of what is in Christ. And understanding what is in Christ and living in the light of that reality is of the essence of the Christian life. Hence this book, co-authored by Vanhoozer and Strachan. It has long been an ambition in the former's body of work 'to make the pastoral lamb lie down with the theological lion.' (The Drama of Doctrine: A Canonical Linguistic Approach to Christian Theology, Kevin J. Vanhoozer, WJK, 2005, xii). The central thesis of this book is that the pastor is a public intellectual; a theologian for the sake of the people of God. That point isn't widely understood, even among Evangelical churches. All too often the church has borrowed its understanding of leadership from the world. The pastor is seen as a CEO, counselor, or kindly social worker. We need to return to the biblical model of Minister as pastor-teacher, whose main role is to communicate what is in Christ to the people of God. This vision is rooted in the Scriptures. Strachan devotes a fascinating chapter to the differing ways in which prophets, priests and kings functioned as theologians to the Old Testament people of God. He argues that pastors now function as prophets ministering truth, priests ministering grace, and kings ministering wisdom. Of course, Christ is the great Prophet, Priest and King. In a very real sense all God's people share in these three offices under the new covenant. But Strachan sets out the lines of continuity between the key Old Testament offices and pastoral ministry as described in the New Testament. Indeed, his case may have been strengthened had he made mention of the way in which the Old Testament kings were called 'shepherds' and that pastors have been appointed to 'rule' in the church as part of the eldership team (1 Timothy 5:17, Hebrews 13:17). Strachan also traces the historical development of the pastoral office over the course of church history. 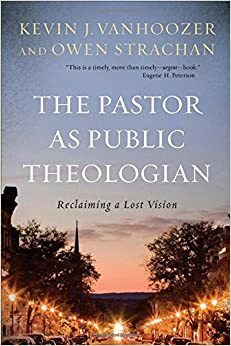 Next Vanhoozer gets us 'In the Evangelical Mood: The Purpose of the Pastor-Theologian', giving attention to the indicatives and imperatives of the gospel that the pastor is to inhabit and minister. According to the philosopher Heidegger, human life is afflicted with a nagging sense of anxiety concerning our finite condition. The human being is a being-towards-death. But the good news of Jesus Christ transforms believers into beings-towards-resurrection.They have been delivered from the fear of death and look forward in hope to a new creation that has already begun to dawn in Christ, and through Christ, in them. The focus is not so much on ousia (being in general), as parousia (being in the light of Christ's coming). Pastors are called to minister this reality by setting out the grand indicative concerning what God has done in Christ for his people. They help the people of God to grasp what is in Christ and what they are in him by ministering the word, thus nurturing believers in biblical literacy. Being equipped with 'canon sense' will also help Christians to understand, critique and relate the gospel to the culture in meaningful ways. But the pastor's task is not limited to declaring the good news of Jesus in the indicative mood. They must also set out the imperatives that flow from participating in what is in Christ; getting wisdom, walking in love and imitating Jesus. Thus, pastors help the people of God to play their roles in the great drama of God's redeeming grace. The practical skills that pastors need to accomplish their work are the focus of attention in the next chapter, 'Artisans in the House of God: The Practices of the Pastor-Theologian'. They include building the church as a disciple-maker, proclaiming what is in Christ as an evangelist, teaching what is in Christ as a catechist, celebrating what is in Christ as a liturgist, and demonstrating what is in Christ as an apologist. These differing facets of the pastoral ministry are explored with a good mix of sound biblical insight and shrewd practical application. The use made of Ezra-Nehemiah in the section on building the church made for interesting reading, as I've not long completed a series of sermons on those Bible books. Vanhoozer concludes with Fifty-Five Summary Theses on the Pastor as Public Theologian. Interspersed between the major chapters of this book you'll find twelve 'Pastoral Perspectives', short pieces written by pastors that aim to show what it means to be a 'pastor-theologian' in the context of everyday church life. One of them is by yours truly on The Drama of Preaching. I can't really vouch for that bit, but I'd recommend that all aspiring and serving pastors give this book a thoughtful and prayerful read. If the pastor as public theologian is a lost vision, this well written and passionately argued book certainly makes a grand attempt at reclaiming it. Anything that helps pastors to minister what is in Christ more effectively must be good for us, the people whom we have been called to serve, and the world that so desperately needs to hear the life-transforming message of the gospel.